In The Great Gatsby, F.Scott Fitzgerald told the tale of a high society love affair that became an iconic depiction of life during the Jazz Age of the 1920s. After the 1929 stock market crash, life took an ironic downturn even for the wealthy. Written in light of these events, The Golden Vanity is both a social comedy of errors and a sardonic view of the Jazz Age and the crash, told through the lives of three self-assertive women who could not be more different. Cousins Gina, Geraldine, and Mysie are all inhabitants of New York City, but their lives could not be more different. A secretary starts a new job rife with romantic entanglements, a best-selling novelist is undermined by her husband's attempts to win big on the stock market, and an actress leads an unconventional, yet surprisingly intellectual, life. Isabel Paterson follows their stories through the economic collapse and demonstrates, with sophisticated wit, that "doing what everyone else is doing" is not the best way to survive such times. 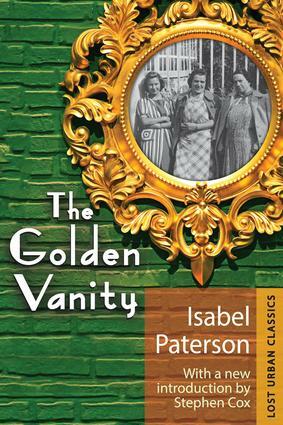 Originally published in 1934, The Golden Vanity has been out of print for far too long. A new introduction by Stephen Cox illuminates the novel's important historical footprint and places it in a modern context.